I always thought the saying that grapefruit was as bitter as death was just a metaphor. Turns out, it's a warning. If you're on medication, grapefruit can be surprisingly dangerous. It can force your body to overdose. In 1998, a group of researchers decided to do a study on the interaction between felodipine, a drug prescribed for high blood pressure, and ethanol. They believed that "a non-intoxicating amount" of ethanol increased felodipine's effectiveness. Ethanol's more common name is booze, and as it is unsafe and unpleasant to distill it too much, the researchers in charge of the study cast about for a way to mask its taste. They decided to use grapefruit juice, trusting that study participants wouldn't be able to pick out a little liquor in eight ounces of pure bitterness. After reviewing the results, the researchers were puzzled. They had controlled the amount of drug that the participants ingested, and yet it was present in the participant's blood at levels five times higher than they had expected. As this happened whether there was alcohol in the juice or not, they ruled out the alcohol as the culprit. After also ruling out simple lab mix-ups, they were left with only one conclusion. Grapefruit juice had flooded the participants' systems with drugs. Today, there is a list of 85 different drugs that interact dramatically with grapefruit or grapefruit juice. Most of the time, the juice causes overdoses. The body, unsurprisingly, isn't keen on accepting whatever drugs happen to make it into the gut. There is an army of systems designed to break down anything a person happens to ingest to its most basic (and harmless) components. Among this army is cytochrome P450 3A4, or CYP3A4. It's an enzyme that rips drugs apart. Correct dosages for these drugs are calculated with this enzyme in mind. Through experimentation, researchers are able to estimate how much of a drug gets broken down, and send in a large enough dose so that some of it gets absorbed into a person's system. Grapefruit juice blocks the enzyme. With the enzyme out of the way, the entire dose of the drug invades. People can overdose just by drinking a glass of juice for breakfast. They can also under-dose, as well. 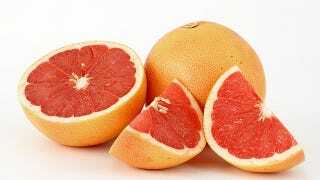 Grapefruit juice, on its rampage through the body, also takes out a group of transporters in the metabolism. When these transporters are inactivated, they stop transporting certain drugs into the bloodstream. Everyone has different amounts of enzymes and transporters in their body, which is why most medication doses need to be fine-tuned over a period of time. It also means that, depending on the circumstances, grapefruit juice can dose a person with five times their expected amount of medication, or completely block the medication from their system. Grapefruit is not alone in this behavior. Other citrus fruits, like oranges and limes, have the same effect, but to a far lesser degree. Grapefruit just happens to be the worst, and most disgusting-tasting, culprit of the citrus family.